Another week has gone by and more of our ladies have been sent home from this crazy adventure we are on. Did you check out the layouts from last week? Make sure to see all the Treasures our ladies shared in the Week 3 Gallery. It seems like almost allof the GingerScraps gals have gotten word, they are all blending right in with the pirates. You have started to hold secret meetings and exchange ideas about how to fight these pirates. To be quite honest, many of the pirates seem very unhappy with the pirate captain and you think they may join together and try to overthrow their leader. This all might play out perfectly and it is possible you will not have to get involved at all. But just in case, you (and your fellow scrappers) have decided to start tracking all the movements of the pirate captain and his crew of leading men and women. You start a journal of what they do, from the time they wake up, until the time they go to bed at night. If you have to orchestrate a plan to take down the captain, you will be prepared! 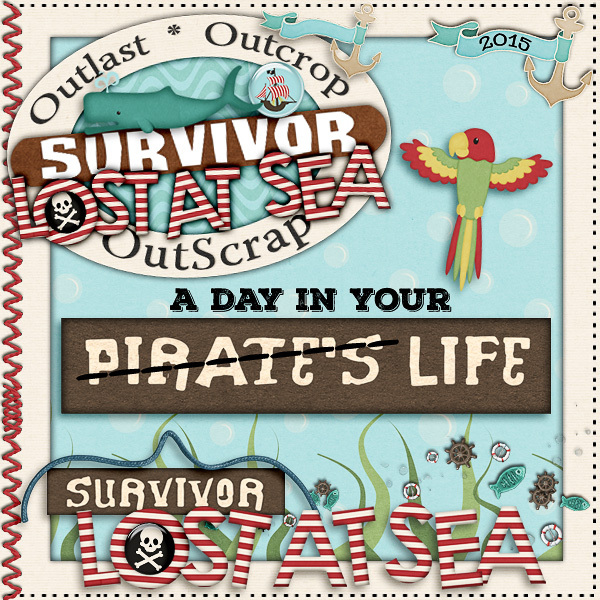 Inspired by tracking the life of the pirates, this layout will be all about a day in YOUR life. Pick a day, take photos and notes as to what you did that day, then scrap it! This layout is all about a day in your life. The LO must have at least 6 photos of things you did during the day. The LO must have the date of your “day in the life”. There is no maximum numbers of photos allowed, go ahead and take as many as you want! In the Tribal Council forum post, type out your journaling, so all players can read your journaling. Templates ARE ALLOWED in this challenge. You must use ALL 100% GingerScraps products when creating your Layout. *Remember* Always credit the products you are using, when posting in the gallery. List the credits in the description box when uploading. When checking layouts, I need to be sure all products are from GS designers- so credits are crucial!! Come check out the Week 4 Gallery and see what the girls are up to. Make sure to leave them some love and encouragement as well. Good morning scrappers! It is that time of week where we take a look at the past week’s Survivor layouts. We just finished week 3! So what was Week 3’s challenge? While you wait to see if your message in a bottle finds its way to a willing savior, you have continued to put on your pirate disguise each day. You are blending in quite well, and actually learning some very interesting things about these pirates. One buccaneer told you that the pirate captain has a treasure hidden on his ship, it is said to be a huge booty of doubloons and rare gems! He wants to get a crew together to steal the treasure. This sounds like risky business to you, the last thing you need is to get wrapped up in some crime with a band of pirates! You wish the buccaneer luck and move along. As you walk away you begin to think about your own life, and your treasures. If you were to make a treasure chest, what prized possessions would you stowaway? This layout is all about your own “booty”. If you were to put your most prized possessions in a treasure chest, what would they be? What did I tell you? Great layouts right? All so different but all stand outs in their own way. Week 4’s challenge isn’t posted yet. make sure you keep an eye on out on the forum for it to be posted. When you get those layouts scrapped, upload them to week 4’s gallery. We will be back later in the week to shout out to some of the stand outs! Have fun! How much fun is everyone having? It’s hard to believe it’s already week 3. Before we go further, head over to the Week 2 Gallery to see the awesome letters our ladies wrote. So what are our scrappers turned pirates up to this week? The LO must have at least 2 of your most precious possessions. The LO MUST have photos of the items you would put in your treasure chest. There is no maximum numbers items or of photos allowed. 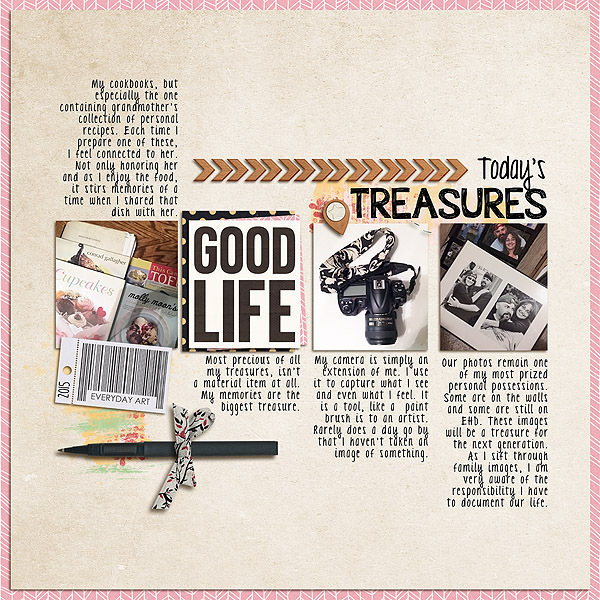 Be sure to journal on your page, so we can learn what your treasures are, and you can preserve them in a scrapbook page for years to come. You treasures do not have to be actual physical items, for example, if one is your religion, then find an item that will represent that, such as a bible. Maybe your treasure is your child or pet, then find something that can represent that child or pet, something that you could take a photo of, like a drawing by your child, or your dogs favorite toy. Make sure to check out the Week 3 Gallery and leave some love for our pirate ladies!! 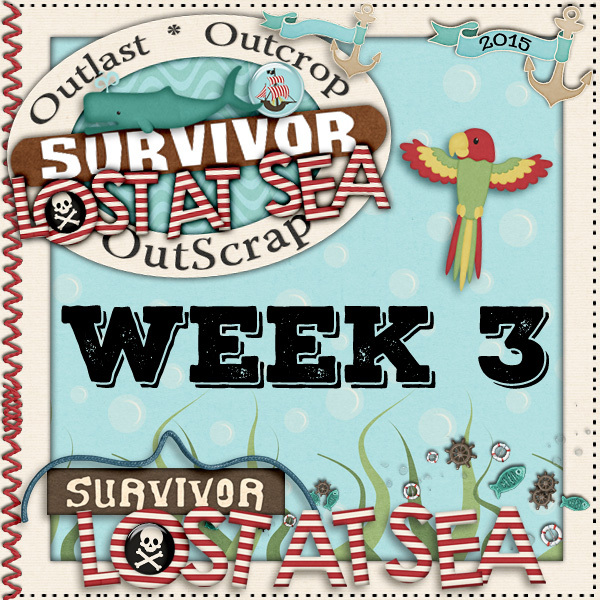 It’s Week 2 in Scrapping Survivor *Lost at Sea* and things are getting fun. 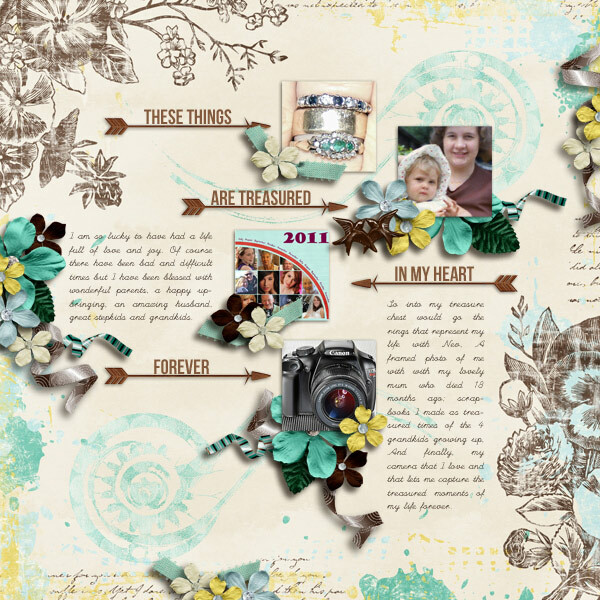 Make sure to check out the Gallery to see some of the great and creative layouts from last week. So many ways to make yourself a pirate. Wow, you are pretty impressed with yourself and your friends! You pulled it off! You were able to act like one of the pirates and wander around the cruise ship undetected! You secretly tell other women to spread the word, and soon you begin to see ladies you know from GingerScraps, walking around and acting like pirates! Hopefully the real pirates won’t catch on!! You decide that it is time to come up with a plan to get rescued from this situation. Of course there is no way for you to call or text for help, you’re in the middle of the sea! How about the call for help, from the old days…. A message in a bottle!! You tell all your fellow GS friends the plan and you all begin to craft your messages, to be thrown in the sea and hopefully end up in the hands of someone willing and able to help. 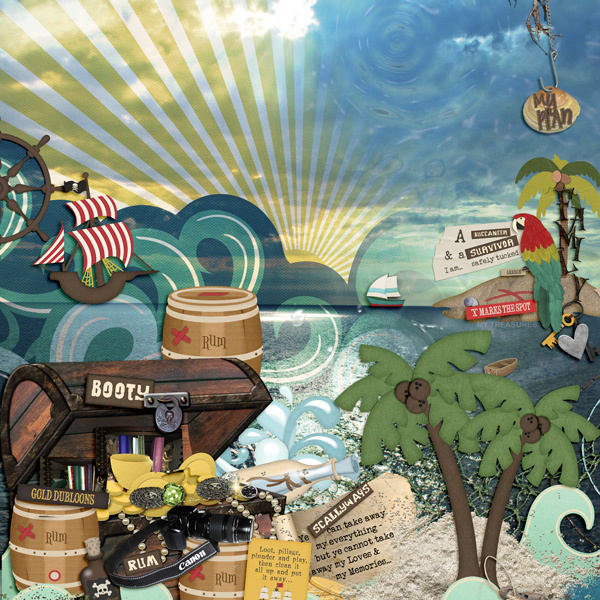 This layout is all about your “message in a bottle”. You need to write a letter to the person you think (or you wish) would come to your rescue. This person can be living or passed on, they can be a person you know, or someone that you wish would save you (like Dwayne “The Rock” Johnson). The LO must have your message to who you would like to “save” you, use journaling to write your message. The LO MUST have at least one photo of the person you are writing to. There is no maximum numbers of photos allowed. **IMPORTANT** During the week 1 challenge I was lenient about the 100% GS products rule. I did state that I would allow 1 unique element. HOWEVER, this did cause some confusion, so moving forward- we must stick to the rules of 100% GS Products! Fonts do not count, you are allowed to use any fonts you prefer. But ALL other products on your layout must be from GS designers. Thank you for understanding, keeping the rules clear is important and helps everything run smooth. Use this opportunity to write a love letter to someone you love, tell them why you love them and admire them. Write an actual letter then scan it in and use that on your layout. Have fun finding fonts that look like your handwriting (or what you wish your handwriting looked like). 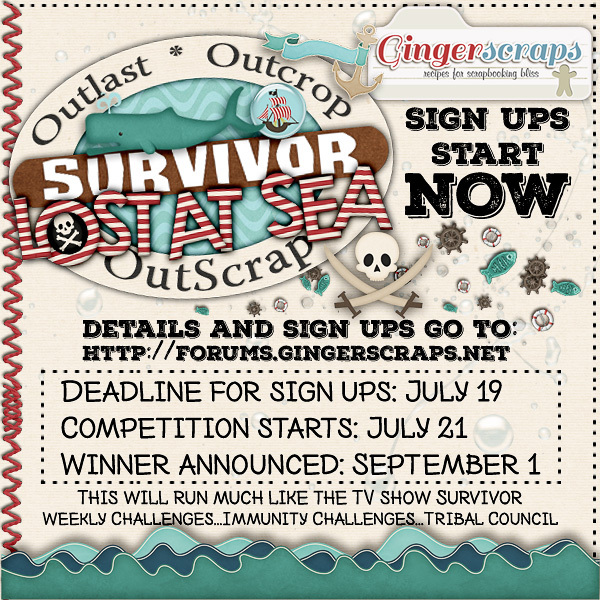 Take a look at the Official Scrapping Survivor Season 6 *Lost At Sea* collab! It is an awesome collab and packed full of goodies perfect for your Survivor challenges. Check out the Gallery for the Week 2 Challenges and leave some love. It’s Week One of the new season of Scrapping Survivor. During the sign up period there were many questions asking what it was about and what a scrapper had to do. So, this year, on Wednesdays, we’re going to be posting the week’s challenge so even those not participating can see the backstory and put this on their to-do list for next season. Our own sweet Ginger puts so much time into setting this up and she really makes you think. So, on to the first challenge. The day has come!! You have been counting down the days for so long, you can not believe it is finally here! The first ever GingerScraps Cruise! As you stand in line to board the ship, your trusty laptop under your arm, you get a rush of excitement. You see one of your best digi-friends coming your way, and make a bee-line for her. After you both squeal like teenage girls, you get back into line with your bunk mate for the next few weeks. Once on the ship and settled into your room, you look at the itinerary for the week. The ship will set sail in just a few hours, followed by the meet and greet. The weeks events look like so much fun, there will be something to do 24 hours of the day, crafting, hybrid, games, contests, and of course non-stop scrapping! As you freshen up to get ready for the meet and greet, you hear the voice of the ship captain over the intercom. He goes over a few safety regulations, and you feel the boat start to slowly pull away from the harbor. You are off, the digi-scrapping cruise has begun!…. The meet and greet is wonderful, you get to see many of the ladies you have grown so close to over the last few years. You have shared your life with them through the craft you all love, you have seen their children grow up, you have laughed with them in the forums, and chatted with them in the chat room, and now you get to hug them and see them face to face! You are so filled with excitement that you feel like you will never be able to sleep tonight. But once in your cozy pajamas and tucked into your sleeping quarters, you are rocked to sleep by the motion of the this giant floating vessel…..
You turn and look at your roommate, and then look to the other women in the hallway, panic spreads quickly! You shout that anyone who needs a place to hide, is welcome to come into your room. A few ladies rush to your room, and once the hall is clear, you slam your door and lock it. How could this really be happening!? They hesitate but agree that it sounds like a solid plan. You rummage through all the luggage you and your roommate brought and dress the part, makeup, jewelry, and hairdos to match. You all practice speaking in pirate, and when you feel like you are ready…. you crack your door open and walk out into the hall…. It’s time to show off your pirate disguise. Scrap yourself and or your family and friends in your best pirate disguise. The LO must have a least ONE photo of YOU as a pirate. You can also have photos of family, friends, pets etc… but everyone (even the animals) in the photo MUST look like a pirate. You can create your disguise using photoshop techniques OR actually dress up like pirates and take photos. It must have the words “shiver me timbers” on your layout. 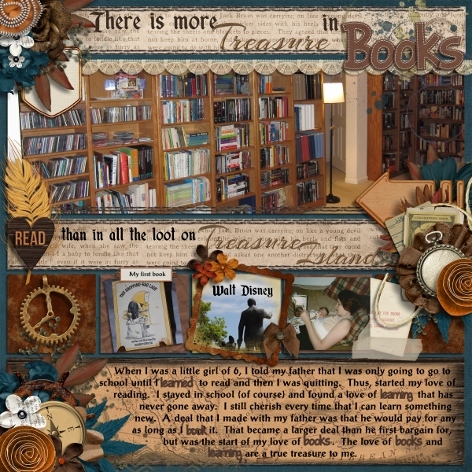 It can be in your journaling, as a word art, as the LO “title” etc. It must be visible. In the Tribal Council forum post, type out your journaling, so all players can read your journaling (if you have any). Make a day of this! Dress up your family like pirates and take photos! This will be a fun memory for years to come. Take a selfie (a photo of yourself) dressed as a pirate. Show off your photoshop skills and turn yourself into Jack Sparrow. Make sure to check out the layouts posted in the Gallery for this challenge and leave some comments for our contestants. As a reminder, sign ups are over for this season, but we wanted to share the fun for you to see what it is all about. Last Day for Sign Ups! Hello scrappers!! Tomorrow is the last day for 2015 Scrapping Survivor. Lost at Sea. We are going to be *Lost At Sea*! Throughout the weeks, there will be Immunity Challenges. These Immunity Challenges are usually very fast paced! If you are lucky enough to win an Immunity Challenge, you are safe from that weeks vote out. Every Weekly Challenge and Immunity Challenge has specific rules. ALWAYS READ THE RULES!! It is an awful shame when a player must be eliminated because they did not read the rules carefully enough. During our Survivor adventure you will compete to win a grand prize. A huge collection of coupons from our GS Designers. A Season Pass for one year, every item in the GingerBread Ladies shop collabs category will be yours for free. A $50 Cash Prize! Sent directly to your Paypal account. A $20 Cash Prize! Sent directly to your Paypal account. $30 Cash Prize! Sent directly to your Paypal account. Pretty awesome right?! I competed last year & it is how GingerScraps became my scrappy home. It is challenging, but a lot of fun! Not something you are going to want to miss out on. Make sure you get signed up before the tomorrow deadline passes!! You will not regret it. If you have any further questions or just want to chit chat about the fun challenges to come, check out the forum HERE! We will see you at sea! Good Monday morning everyone!! Have you heard?! This years Scrapping Survivor is here! Pretty awesome right?! I competed last year & it is how GingerScraps became my scrappy home. It is challenging, but a lot of fun! Not something you are going to want to miss out on. Make sure you get signed up before the deadline! If you have any further questions or just want to chit chat about the fun challenges to come, check out the forum HERE!